Added on June 27, 2014 by Renée Ricciardi. On Monday I was fortunate to exhibit and talk about my artwork from the Bees in Italy series. The night was first proposed over ten months ago, when I was invited to speak about my photography to Nerd Nite Milan. Very happy to make the presentation a reality! "On June 17, 2014, Nerd Nite Milan was lucky to have a presentation and pop-up photography exhibition with work by Renee Ricciardi, art photographer and beekeeper from Boston, MA. Renee is traveling around Italy for the second time, visiting beekeepers and exploring the relationship between bees and beekeepers and the larger picture about our experience with and relationship to the natural world." Added on June 25, 2014 by Renée Ricciardi. It was a rush, a full sensory experience, walking into the apiary and seeing colonies of familiar bees. It was like I never left Italy last fall, time meant nothing. Seeing them in buzzing, hectic, mid-day flight overcame me with a sense of gratitude for everyone who helped me get this far! Next I took the train to Torino (Turin) and visited the countryside as well as rooftop bees in the heart of the city!! Glad I'm not afraid of heights!! My friend’s grandmother even gave me a traditional recipe that I will be sharing in my Italian e-cookbook.. so get ready! I got the opportunity to re-visit apiaries that I have already photographed last fall. This is a major component to the project, since the subtle changes that occur between seasons have more of a presence than they would otherwise. Also, by revisiting old friends I was able to hand deliver some printed photographs for my hosts to keep! Next stops include Liguria, Florence, Verbania, Padua, and Rome. Added on May 12, 2014 by Renée Ricciardi. I was honored to be invited to speak about my current photographs at Into Your Art's event, Minding Your Art Business panel discussion in Boston. I talked about the Bees in Italy series, art marketing strategies, and the Free Flowers Project. Added on April 29, 2014 by Renée Ricciardi. I was invited for the second time to speak about my photography at the Plymouth County Beekeepers Association (PCBA.) The lecture lasted about 40 minutes and it was exciting to have such a lively Q&A session afterwards. BeeTIME magazine recently published an article about the Bees in Italy project. Added on April 19, 2014 by Renée Ricciardi. I was approached by Honey Colony about writing an article about my story as a photographer working on the Bees in Italy project. I love sharing my adventures so please read it here. Added on April 17, 2014 by Renée Ricciardi. The project Bees in Italy was featured in an article on Restoration Spring. The article touches on the importance of the photography project, bee policy, starting over, and following dreams. 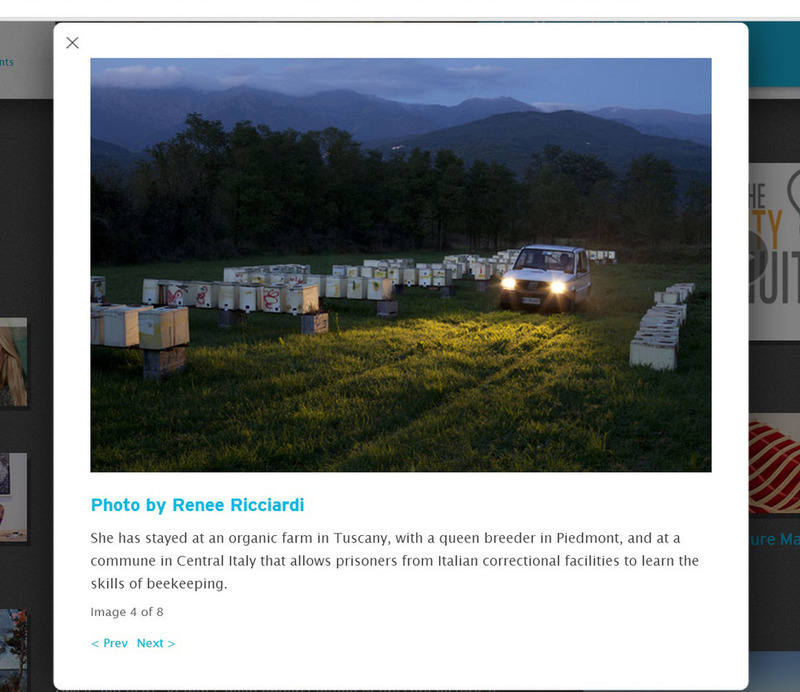 Please check it out: Bees in Italy: The Photography Project of Renée Ricciardi. Added on April 8, 2014 by Renée Ricciardi. I recently did an AMA on Reddit. Strangers were able to ask me anything about my photographic journey, beekeeping background, and general experience. It was a great chance to spread the word about the Bees in Italy photography project and my experiences in Italy. My kickstarter video for the Bees in Italy photography project is currently featured on Moby Gratis. The music in the video was composed by DJ and producer Moby. The film was produced, directed, and edited by Boston based film maker Brandi Diaz. Some photographs from Bees in Italy Part One are currently on view on the photography blog, Cable Release. Added on April 7, 2014 by Renée Ricciardi. I am thrilled to say that I was featured in the arts and entertainment section in the April issue of Bostoniano Magazine written by Briana Palma. The article and photographs can be found here. Added on March 11, 2014 by Renée Ricciardi. I had the pleasure of collaborating with Valerie Ricciardi, owner of Abigail Adams Preschool to curate a body of student-made artwork, called Creative Moments. Everyday during the month of January, I chose one of the many creative moments that I found happening in the classroom, and either photographed that experience, or collected the artwork. Creative Moments was exhibited in Fun a Day Boston at Voltage Cafe and Art. Added on March 7, 2014 by Renée Ricciardi. 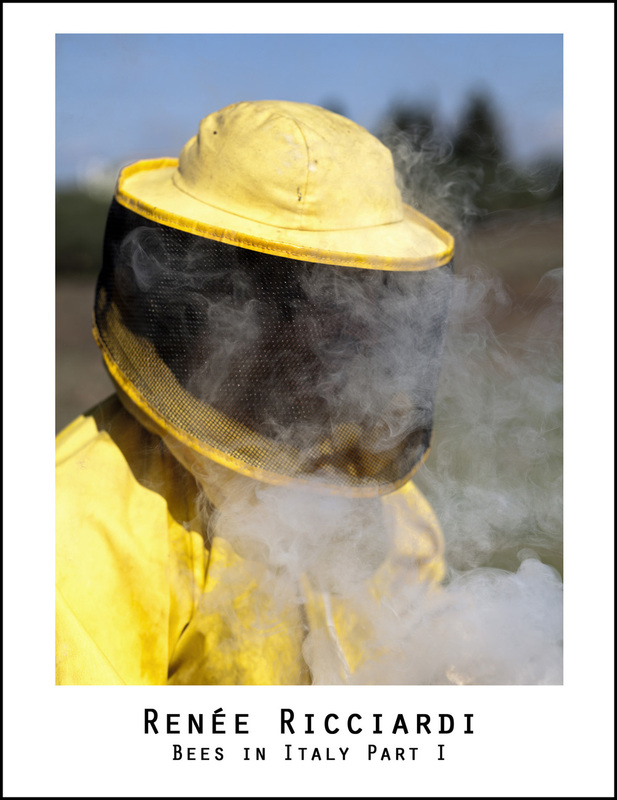 Opening Reception: Thursday, January 30, 2014 — from 7 to 9 p.m.
Renée Ricciardi‘s respect and fascination with honeybees has taken her across the globe. More recently, she spent three months in Italy, working on an extremely personal photography project involving bees and beekeepers. These photographs have never been seen in public before. The opening is free and open to the public. We hope you will consider a tax-deductible donation to Beyond Benign‘s Green Chemistry education and outreach program, which seeks to advance green chemistry in the classroom and beyond. Added on February 13, 2014 by Renée Ricciardi. Added on January 26, 2014 by Renée Ricciardi. During the month of January, I am participating in Fun-a-Day Boston by curating a month's worth of art/creative moments that I find around the classroom at Abigail Adams Preschool. By gathering student made artwork and using photographic documentation, I am collecting creative learning experiences as they happen. Read about what other artists are making here. Added on December 31, 2013 by Renée Ricciardi. A one-time performance piece of the consumption of six cupcakes with photographs and text baked inside each cupcake. Text is handwritten virginity loss stories of friends and strangers, paired with my 1.5 x 1.5 inch photographs that are my associations and interpretations of each woman's story. Added on December 9, 2013 by Renée Ricciardi. The show will be on view for the month of December. Works purchased may be taken from the wall early if needed for a holiday gift! Two photos from my Biogenesis series are on view for the month of December at Aviary Gallery. Added on November 22, 2013 by Renée Ricciardi. I am honored that the Massachusetts College of Art featured my photographs and story on their website homepage. This body of art is still in the works, and this is the first time the photographs are released for the public.